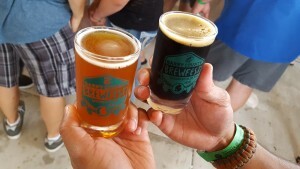 Now entering its third year, the Barry County Brewfest has worked out many of the test phases of what makes a great brewfest in a state known for producing some of the best tasting beers across the nation. With over 300 breweries in the state, consumers have lots of choices when it comes to trying new beer. 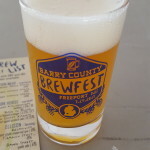 Lucky for us, the Barry County Brewfest has put together a great lineup of breweries large and small from the state offering beer samples for all who attend. A handful of cider, mead, and wine samples will also be available for those who enjoy these additional alcohol beverages or may be curious to try. 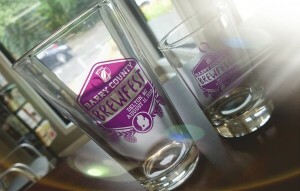 Barry County Brewfest (Facebook Page) heads to Delton for its third year. The event coincides with the Founders Festival, also taking place on August 11th in the small Barry County town. 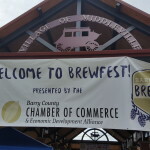 The Brewfest runs from 2pm until 8pm on August 11th. The event takes place at William Smith Park. Shuttles will take people from the event from the local school parking lots. Look for signs as you drive towards the event. The map here shows several of the schools. Tickets (Buy them here) for this event are only $16 if bought in advance, or $20 the day of. This is a drop from the prior two years and a great reason to come to the event if you are on the fence. Each ticket comes with five tasting tickets (for food or drinks) and a commemorative tasting glass. Additional tasting tickets can be purchased for $1 each. A limited run of merchandise (like shirts, hats, ceramic mugs, and pint glasses) will be available for sale at the event. Food for the event is being provided by the Delton Moose Lodge, which will include hot dogs, brats, and fries. Tasting tickets or cash can be used to pay for food. Arbor Brewing, Bell’s Brewery, Blackrocks, Dark Horse, Dragonmead, Ellison, Farmhouse Cider, Glass Creek, Grand Armory, Haymarket, Ludington Bay, Mari, The Mitten, New Holland, North Pier, Tandem Cider, Pigeon Hill, Schramm’s Meadery, Starving Artist, Sietsma’s Cider, Tujax Tavern, Walldorff Brewpub. 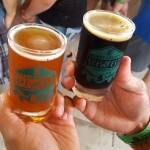 We have previewed and reviewed both the 2016 and 2017 Barry County Brewfest events. You can check out the previews (2016, 2017) and review here (2016, 2017). The reviews feature our five favorite beers from 2016 and a selection of 15 favorites from 2017 based on three attendees. Once again we had the chance to speak to event organizer and Barry County Chamber of Commerce President Travis Alden. Alden is pleased with the lineup of breweries and other beverage options and has listened to feedback from prior event attendees. A theme again is the amount of new breweries attending the event and also the amount of limited release or barrel aged beers coming to Brewfest. Alden helps pick smaller brewpubs for the event and also works with a distributor like Alliance Beverage to secure the larger breweries for the event, due to Michigan’s distribution system. Alden is pleased to have a “mix of the big guys with good name recognition along with a good selection of smaller ones that folks here in Barry County may not have heard of, let alone tried their beers before.” Alden makes a good point that, “Discovery is a big part of an event like Brewfest – you might find your next favorite brew! It seems fitting that the Barry County Brewfest would also include the best alcoholic offerings from Barry County. Walldorff Brewpub, based in Hastings, returns for a third year with a strong lineup of beer. Glass Creek Winery, also of Hastings, returns with wine and beer. Tujax Tavern, located in Delton, joins for the first time. The 2018 Barry County Brewfest will feature some harder to find beers and specialty releases. Alden tells us, “We encouraged breweries (including those through the distributor) to bring a specialty selection to the event and we have a number of those.” This includes Bell’s 30th Anniversary Cherry Stout Reserve, Walldorff’s Oak Aged Old Woody (Russian Imperial Stout), Pigeon Hill’s barrel aged Walter Blondale, and Walldorff’s Batch 1000 specialty release. This year’s Brewfest also features several New England IPAs (juicy, hazy) for the first time, one of the hottest and best selling beer trends in the state of Michigan and elsewhere. “Cider went very well last year, so we added a little more of that. It’s always important to have varieties for non-beer drinkers to enjoy, so everybody can have a great time at Brewfest,” Alden said. We see on the list three cider places that we have never tried before (Farmhaus, Tandem, Stietsema’s) that we are excited to sample. One of the big highlights at the 2018 Barry County Brewfest promises to be Schramms Mead. Schramms is considered one of the best meaderies in the world, winning awards from the likes of ratebeer.com. A look at Untappd will see Schramms Meads amongst the highest ranked in the world. Mead is an alcoholic beverage made by fermenting honey. Often times, meads have fruits mixed in. 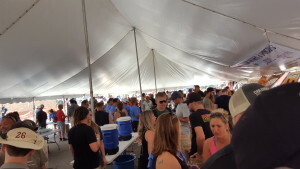 The alcoholic content can be quite high on meads and all three offered at Barry County Brewfest come in at double digits. 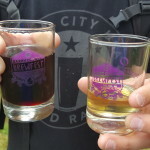 Each sample of Schramms Mead will also cost two tickets ($2 equivalent). Based on ratings and the worldwide reputation Schramms has when it comes to mead, I’m guessing this is a steal. If a selection of more than 80 alcoholic drinks to sample wasn’t enough to get you excited, then there’s also the Beard Derby. 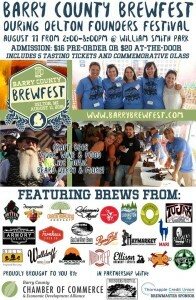 The Barry County Brewfest has to be one of the most unique festivals around as it combines beer with the great art of beard growing and grooming. The Bearded Villains of Michigan will be on hand again to host the Beard Derby where contestants will be judged in categories like thickest, business beard, and longest. The Beard Derby takes place at 5:30, but you can see the great beards throughout the day, as contestants walk around sampling beers with everyone else. The Bearded Villains will also be selling 50/50 raffle tickets to benefit Mission 22, an organization that supports veteran suicide prevention and awareness. 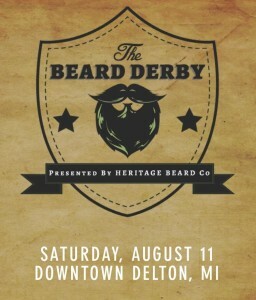 We have had a blast watching the Beard Derby the past two years and are looking forward to this one as well. Again, if you haven’t seen one in person, considering coming for Brewfest later in the day to make sure you stick around for the competition that begins at 5:30. 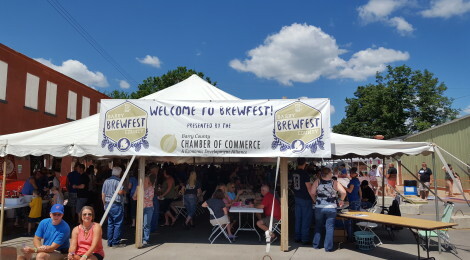 Last year’s event was held in Freeport, which Alden said would likely be the smallest community to host Barry County Brewfest. With that said, Alden believes attendance will rise this year and he expects over 1,000 people to attend Barry County Brewfest in 2018.